Important biblical map of the Sinai by the founder of 'Palestinology'. Map of the Peninsula of Mount Sinai and Arabia Petraea from the itineraries of E. Robinson and E. Smith. An uncommon map of the Sinai Peninsula by the classical scholar and cartographer H. Kiepert. Covers from the Red Sea to the Arabian Peninsula. This map is based on the 1838 travels of E. Robinson and E. Smith in this area. Robinson and Smith, in search of unidentified Biblical sites, traveled throughout the Middle East but most particularly in modern day Israel, Palestine, Lebanon, Egypt, Jordan, and Syria. The duo used local traditions as well as established Biblical scholarship to identify a number of important sites. This map is largely the result of their research and work. Their route, shown in red, leads from Cairo eastward, through Suez, then south, skirting the rugged interior, to Mount Sinai, then northwards past Aqaba, into modern day Israel. Most place names are transliterations of Arabic though biblical references are included where appropriate. There are two inset maps. The first, in the upper left quadrant focuses on the Cairo-Suez portion of the journey. The second map, in the lower right, details part of the remarkable ruined city of Petra, known as the 'Rose red city half as old as time.' This map was drawn by Heinrich Keipert, a noted expert on historical cartography, for Robinson's important work Biblical Researches in Palestine, and in the Adjacent Regions. Edward Robinson (1794-1863) was an American biblical scholar, known as the "Father of Biblical Geography". He has also been referred to, by scholar James Pritchard, as the "founder of modern Palestinology". Robinson was born in Connecticut and spent the year of 1838 exploring Palestine, Egypt, Syria and Jordan with fellow scholar the Reverent Eli Smith. His great work, Biblical Researches in Palestine and Adjacent Countries was awarded the Gold Medal of the Royal Geographical Society in 1842. In their travels Smith and Robinson identified a number of supposed biblical sites including a tunnel dug by Hezekiah before the Assyrian Siege of Jerusalem in 701-2 BC. His cartographic influence on map of the Holy Land was significant with several important American publishers including Colton and Johnson, updating their maps (and publishing new ones) with based upon his material. Eli Smith (1801-1857) was an American Protestant Missionary and scholar, born at Northford, Connecticut. He graduated from Yale in 1821 and from Andover Theological Seminary in 1826. He worked in Malta until 1829, then traveled through Armenia and Georgia to Persia in the company of H. G. O. Dwight. They published their observations, Missionary Researches in Armenia in 1833 in two volumes. Eli Smith settled in Beirut in 1833. 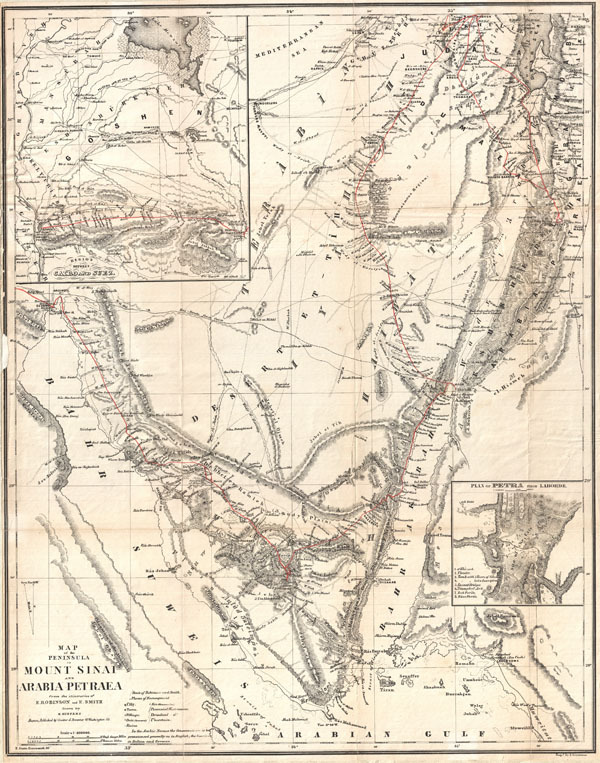 In 1838, along with Edward Robinson, he made two trips to the Holy Land, acting as an interpreter for Robinson in his quest to identify and record Biblical place names in Palestine. He is known for bringing the first printing press with Arabic type to Syria. He went on to pursue his life's work: translation of the Bible into Arabic. Although he died before completing the translation, the work was completed by C. V. Van Dyck of the Syrian Mission and published in 1860. Robinson, E., and Smith, E., Biblical Researches in Palestine, and in the Adjacent Regions. A Journal of Travels in the Year 1838. (Boston: Crocker & Brewster) 1856. Good. Some toning on original fold lines. Margins all round narrow as issued. Minor repairs to border area, left side. Blank on verso.